In the city of Kayin, the decision was taken to build a wall to split the city in two due to diverging ideologies. Now is the time to decide where the wall will run. Each player plays the leader for one side, vying against each other to get the most value to their side. You are using your influence to convince the undecided to join you, have important places on your side and important events in the city’s life happen there. However, you need to find the right ways to exercise your influence. Will you find the inspiration at the right time? You will have to roll the dice to know and choose the ideas (Decktet suits) you keep wisely to take the advantage over your opponent. One player takes all the aces, the other takes all the crowns (Power cards). They shuffle those and place their power card deck face down in front of them. The Excuse and the last Pawn will not be used. All remaining cards are shuffled into a deck placed face down on the side. The three top cards from this deck are flipped face up. Those are available for purchase. 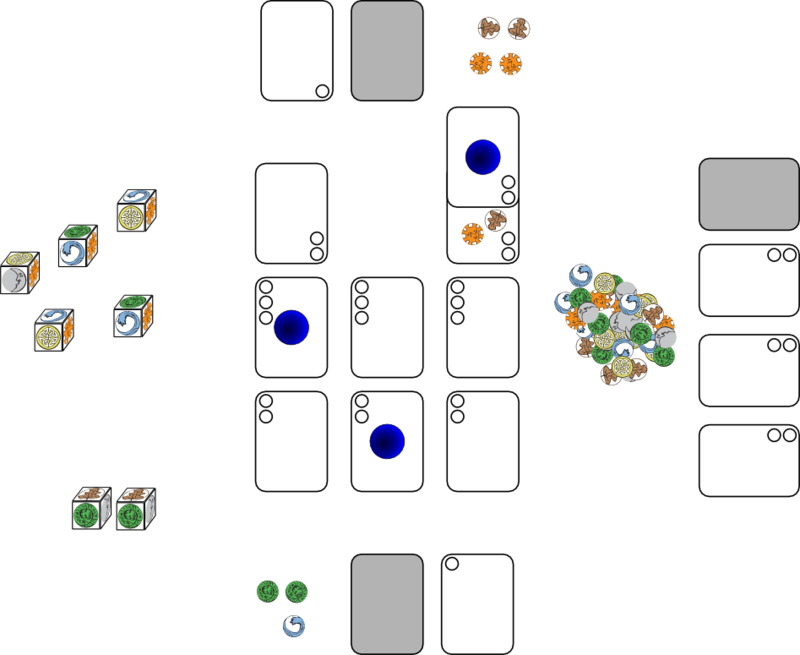 The counters are placed in a pile at the reach of both players. The 7 dice are placed at the reach of both players. take as many counters of one (and only one) suit as there are dice showing this suit. At the end of their turn players flip the top card of their power card deck. This allows them to perform the corresponding action at any time (if applicable) during their next turn. Every time the deck is depleted, reshuffle and keep drawing every turn. Wyrms: Pay twice the price of a card plus one counter (in any suits) on the opponent’s side to make it switch sides (for example, 7 counters to steal a 3-value card). Moons: Pay twice the price of a card minus one counter (in any suits) on the opponent’s side to discard it (for example, 5 counters to steal a 3-value card). Leaves: Pay one counter in any suit to change the result of one (and only one) die. Waves: Pay one counter in any suit to discard one (and only one) of the cards available for purchase. Suns: Roll one more die. Knots: Place one or more of your counters on one or more of the cards on your side. This raises the cost for the opponent to discard or steal this card by two per counter. For the final scoring, the basic values of the cards are still used. 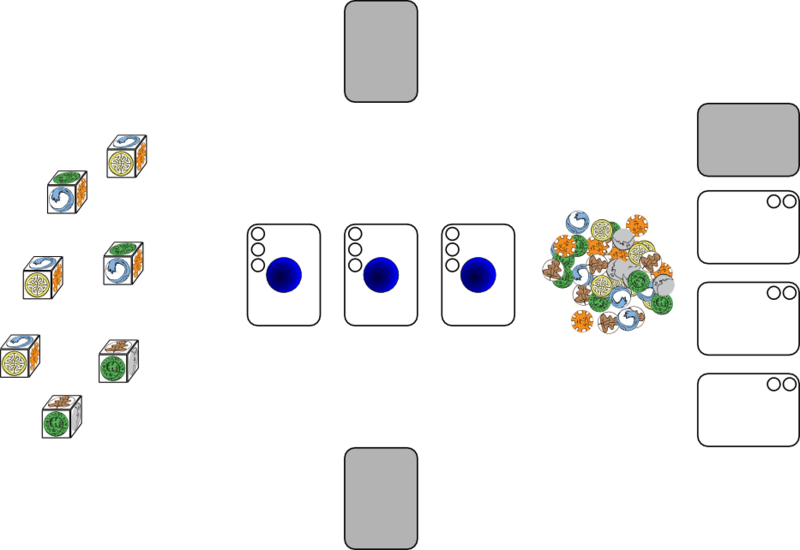 Whenever a player has more cards on their side in one pile, they can buy the cards matching this pile for one less counter (to a minimum of one in each suit on the card). Control of a pile can be signaled by a token. The game ends when both players have had a turn after the last card was drawn from the deck. Players then compare the number of tokens on their side. Whoever has the most wins the game. In case of a draw (0-0 or 1-1), players compare the values of the cards in the tied categories. The relevant marker token goes towards the player who has the highest value in this category. If this is not conclusive, tally up all the cards' values, whoever has more points wins. As a last resort, you can compare the number of counters in front of each player. The Wall uses three Pawns. This game was highly inspired by Cristyn Magnus' Magnate and in a lesser measure by Jesse McGatha's Agricola Express. This game has only been playtested a few times and I will take all the feedback anyone has to offer. Thanks!